Last month, I wrote a post about the Japanese Kappa. 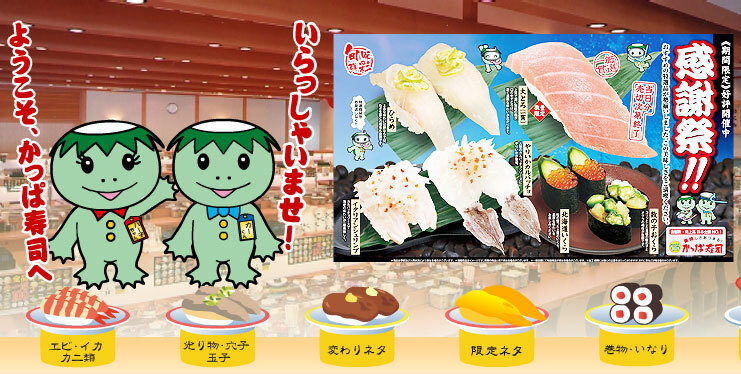 But do you know the inexpensive, but delicious, 寿司 (sushi) chain in Japan called 「かっぱ寿司」 (“Kappa Zushi“)? All of the sushi there cost only ¥105 each for a plate of two sushi. Have you ever tried 「かっぱ寿司」 (Kappa-Zushi)? If you want to visit 「かっぱ寿司」 (Kappa-Zushi) you can find the nearest location by using their website (in Japanese only).